Titan Double Arm Wall Mount | ICWUSA.com Inc. The Titan Double Arm Wall Mount is ICW’s strongest, most rigid computer mount. It’s used extensively in manufacturing, industrial and dental settings. Has long reach, stability, and can support a heavy load. The Titan Double Arm Mount is available in desk, wall, wall track and pole mount options. The Titan Double Arm Wall Mount has long reach, stability, and can support a heavy load. This arm provides smooth horizontal articulation, rotates 180° at the wall mount, swivels 360° at the first and second joints, and stows 12” from the wall. The Titan Arm swivels for precise monitor and keyboard placement. ICW’s ball VESA and Paralink adjustors enable the monitor to tilt, pan and rotate to any desired viewing angle. The Titan Double Arm Wall Mount is available in desk, wall, wall track and pole mount options and is available in several monitor and keyboard configurations. The Titan Double Arm Wall Mount is our strongest, most rigid arm. Built with high quality, durable internal and external parts, the Titan arm is designed to provide years of dependable service under heavy use. This arm moves easily through its range of motion and has adjustable rotation stops to protect the equipment and facility from damage. Internal cable management creates a neater appearance, protects wires and simplifies cleaning. Machined from strong billet aluminum, the unit is powder coated for a durable, lasting finish. 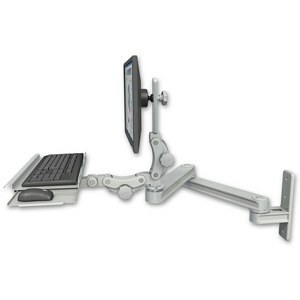 ICW computer mounts are designed, engineered, manufactured and hand-assembled with complete attention to detail. The Titan Double Arm Mount supports up to 28 lbs (12.7 kg) and can be configured with a monitor only, dual monitors, our WorkSurface Keyboard Tray, or a monitor and our standard keyboard tray. The horizontal adjustment range is 44” (112 cm) with monitor only and 63″ (160 cm) with monitor and keyboard. The monitor rotates from landscape to portrait position, minimizing scrolling. The Titan Double Arm Mount is machined out of billet aluminum for strength and durability.